Ron Weasley was never the best wizard, in the sense of being the best at wizarding. His spells tend to backfire, his potions are usually the wrong color and spewing forth some foul odor, and he managed to crash his dad’s flying car into a tree. (Speaking of, why do any of these dorks ride flying broomsticks when flying motorcycles are an option?) But, besides that time he got jealous of Harry and ran off, he has the brave heart of a true friend and a true Gryffindor, and that’s what’s important. He came back! This officially-licensed wand is modeled after Ron’s second wand. When his first wand, a hand-me-down from his older brother Charlie, was snapped by the aforementioned Whomping Willow, Ron received his own brand new wand, selected specifically for him by the legendary wandmaker Ollivander. 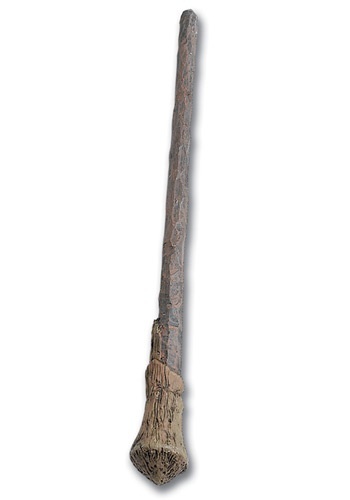 Seen in the movie series from Harry Potter and the Prisoner of Azkaban until it’s confiscated by the Snatchers in Harry Potter and the Deathly Hallows – Part 1, this wand is made of willow with a core of unicorn hair. While ours is plastic––we couldn’t source any unicorn hair despite repeated requests to the estate of Newt Scamander––we’re pretty sure it’s capable of as much genuine magic as you are, muggle.